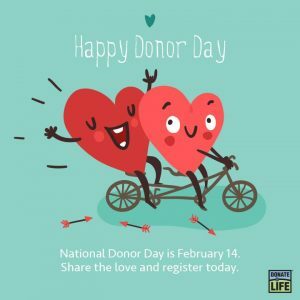 February 14th is National Donor Day, which aims to raise awareness of the lifesaving benefits of organ, eye and tissue donation while reminding of the importance of discussing the topic with your loved ones. 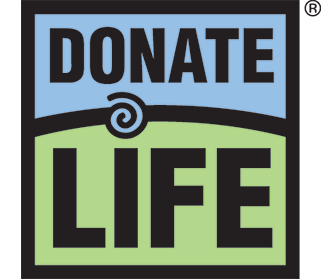 We encourage you to use National Donor Day to discuss organ, eye and tissue donation with those closest to you. What does it mean to sign-up as a donor? Signing up as an organ, eye and tissue donor means you have made the decision to donate your organs, eyes and tissues at the time of your death. Learn more here. Sometimes starting the conversation can be difficult. Learn a few easy ways to start the conversation here. It is important to discuss your decision with your family as that will take priority over your family’s preferences. Making the decision for yourself in advance makes it easier for your family during a very difficult time. Discussing donation with loved ones will help them feel confident and prepared when they are presented with information about the donation process. So #StartTheConversation today and celebrate your heroic choice to save and heal lives with your family! You can share the love this National Donor Day by starting the conversation with those closest to you. Let your loved ones know that just one donor can save up to eight lives through organ donation and save and heal more than 75 lives through eye and tissue donation. Learn more about the need for donation and about how individuals can take action by signing up anytime online at DonateLifeColorado.org or DonateLifeWyoming.org. Want to join in on social media? Share with your loved ones that you signed up to be an organ, eye and tissue donor and why it’s important to you. Be sure to use the hashtag #StartTheConversation. Help us spread awareness for organ, eye and tissue donation. Signing up gives hope to the 2,000 people right here in our local region who are waiting for a lifesaving organ transplant. © Copyright 2019 Donor Alliance Inc. Website Created By Farotech.